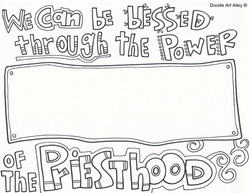 The priesthood is the eternal power and authority of our Heavenly Father. Through the priesthood, God created and governs the heavens and earth. Through this power He redeems and exalts His children. He gives worthy priesthood holders authority to administer ordinances of salvation. All of Heavenly Father's children can qualify to receive these ordinances and access the power and blessings of the priesthood.